Operas don’t come much stranger than Four Saints in Three Acts. Not only does it include at least cameo appearances by some twenty saints (many of them entirely fictitious), and come in four acts, but it also features the strangest of librettos, by the avant-garde writer Gertrude Stein (1874‒1946). Her work, here as elsewhere, is known perhaps above all for its conscious rejection of conventional linearity and coherence, in favour of a much more associative, seemingly spontaneous mode of expression, based as much on the sound of words as on their meaning. Hence, whilst notionally set in early modern Spain, Four Saints does not have anything that could be construed as a plot, or indeed any readily discernible form of logical progression. That is, of course, deliberate, but it can certainly be disconcerting, not least when the words themselves often seem to constitute, if not quite nonsense, then at least a series of entirely unpredictable non-sequiturs. Stein’s language may be bizarre, impenetrable, all too easy to parody or to take cheap shots at; but to the younger Thomson it was clearly an inspiration. The excellent booklet, accompanying Gil Rose’s new recording, quotes the composer as saying that “the spontaneity of it, its easy flow, and its deep sincerity have always seemed to me just right for music”. In keeping with this, he continues, “I took my musical freedom from her poetic freedom, and what came out was a virtually total recall of my Southern Baptist childhood in Missouri”. This latter point perhaps gets us close to the heart of Four Saints’s uniqueness, namely that it is the product of two very different cultural contexts: early twentieth-century ‘Middle America’, and the sophisticated artistic milieu of Paris in the 1920s (the opera was basically written in 1927‒8, though it had to wait until 1934 to be performed ‒ in Hartford, CT, and subsequently – remarkably enough ‒ on Broadway, with an all-black cast). Thomson lived in Paris between 1924 and 1934, and Gertrude Stein, not least through her famous salon at 27 rue de Fleurus, was very much at the centre of the city’s progressive intellectual scene. Along with and through her, Thomson will have met such figures as Picasso, Matisse, Hemingway, Cocteau, Radiguet and ‘Les Six’. So it should come as no surprise that both her words and ‒ to a somewhat lesser extent ‒ his music are imbued with the contemporary Parisian spirit of radical experimentation, knowing playfulness and thoroughgoing determination to épater les bourgeois (amaze the middle classes). On the other hand, and even though one can quite often hear echoes of, say, Poulenc or (especially) Stravinsky, Thomson’s musical idiom remains firmly, and consciously, American. And American in an essentially populist sense. That is to say, it has many features that remind one, for example, of Protestant hymn tunes, of Afro-American spirituals, and indeed of folk music ‒ perhaps more accurately, of the semi-authentic folksiness, espoused also, and perhaps with more consistent success, by Thomson’s fellow Nadia Boulanger pupil Aaron Copland. Thomson’s professed aim in all this was to make Stein’s text as clear as possible: “It needs music to make it run along. Obscure as it is, if you add more musical complexity, you stop it from running along, like putting sand in a gear”. In many ways he is successful in this, but to the detriment, to my ear at least, of real musical memorability. His own creativity seems at times to be weighed down by the many and mercurial demands made on it by Stein’s text. It is perhaps symptomatic that one finds oneself admiring in particular his highly imaginative instrumentation (not least for brass, percussion and the accordion) and relishing such brief instrumental interludes as the ‘Dance of the Angels’ in Act 2 or the ‘Saints’ Procession’ and ‘Intermezzo’ of Act III. In sum, Four Saints in Three Acts is a fascinating one-off that is worth reviving, but which one would certainly not wish to hear every day. Gil Rose’s performance, on the other hand, is absolutely first-class. The recording was based around concert performances, and I think one can tell that from the firm hand that Rose keeps on a pretty unwieldy tiller, and from the assurance of his chorus and instrumentalists (34 and 36 strong, respectively). Amongst the soloists I would single out the eloquent mezzo Lynn Torgove and the resonant bass Tom McNichols, in the substantial but thankless roles of the ‘Commère’ and ‘Compère’, who provide at least some hints of overall structural coherence by acting as masters-of-ceremonies and commentators. All the singers are competent, though some sport a level of vibrato that, to British ears at least, sounds uncomfortably pronounced for recording. As is essential for a libretto like Stein’s, nearly all the words are admirably clear. 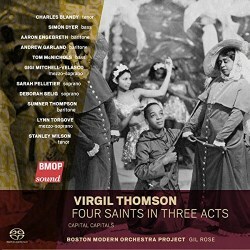 As far as I can tell, this is only the second complete recording of Four Saints (though the composer himself made a heavily abridged version in 1947). The alternative, Joel Thome’s 1981 recording, made in New York, is now available only as a download (Nonesuch 0349712486). It is an admirable performance, notable perhaps above all for its soloists, but clearly yields in sound quality and in documentation to Rose’s newcomer (the latter has a full libretto, an excellent essay by Steven Watson, and numerous good photographs). Unlike Thome, Rose also has a filler, in the shape of Thomson’s setting of the Stein poem Capital Capitals, composed at roughly the same time as Four Saints. In the composer’s words, the work “evokes Provence, its landscape, food and people, as a conversation among the cities Aix, Arles, Avignon and Les Baux” (the four ‘capitals’). In this, Stein is her usual self, whereas Thomson takes his quest for simplicity to a greater extreme than in the companion work. The orchestra is replaced by a piano, and the vocal lines consist almost entirely of recitative, mixed together with elements of ecclesiastical chant. The performance is again very good, but I’m afraid I found the piece just plain tedious.